OK, so self-driving cars are still a few years away, and their ability to work on snow has yet to be proven, but there are some tech tools to make long road trips a bit less painful for families this time of year. Grandma may have once lived two farms over, but now she’s more likely to be in Florida. Costs for flying a family of any size that far pretty much means a road trip down Interstate-95. On my family’s road trips as a kid, my mother was sure reading would cause car sickness so we were not allowed to read in the car. As an adult, I found out I could tolerate it better than expected. I found a few tips on avoiding car sickness while reading. Reading in the car is a good way for kids to pass the time, and it promotes literacy too. And parts of the trip that have sporadic cell coverage are a good time to promote reading. The books can even be on their phones by using the Kindle app, and there are free e-books from the public library. If your child wants to read classics that are now in the public domain, they are totally free from the Gutenberg Project. Watching movies in cars used to require a portable DVD viewer, and while they are still available even more affordably than ever, kids are also amazingly comfortable watching video on the tiny screens of the phone they might already have. Streaming video from Youtube, Netflix, iTunes, Google Play or Amazon might be a bit difficult on a road trip where cell coverage might be spotty. Usually coverage along interstates is fairly good. Away from the interstate is where you might run into problems. 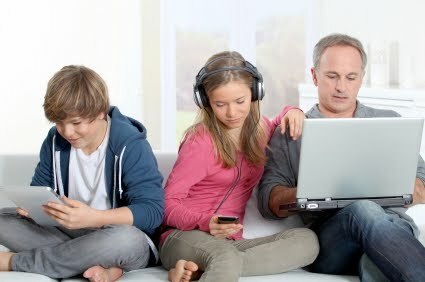 With videos from Youtube or Netflix, an interrupted movie is no big deal; you can watch it anytime when you get better connectivity. With iTunes or Amazon, once you rent a movie, you have 30 days to watch it. Once you begin watching it, you can watch it as many times as you want in 24 hours. Google Play works the same, except with 48 hours to watch. Check your individual movies in case of exceptions. It is more reliable to simply download the movie to your device, something you can always do if you purchase a film. Movies rented from Google Play can be downloaded to Android or Apple IOS devices. What happens if your kids have tablets for surfing the net at home? Often those devices are Wi-Fi only and won’t work in the car. Most cell carriers have the ability to let you Hotspot a cell phone. One cell phone in can act as a Wi-Fi source for three or more devices. The devices login to the Wi-Fi on the phone, just as they might login to a Wi-Fi router at home. The phone takes a request from the tablet for say a web page, and fetches it over the cellular network. It will be slower than Wi-Fi, and will cost an additional fee from your cell provider. Sprint at least lets us buy Hotspotting prorated so it is less than a dollar a day while we travel. Contact your cell provider a few days before any trip to see what they offer, and make sure your phone supports hotspotting. And Google Maps not only can navigate your way to Grandmas, but it can help you find gas, food and lodging on the way. It works hard to find spots that take you only a minimal distance off your route. It can even help find the cheapest gas. A few past columns offer some useful information for trips. A column from April considers how to consolidate the photos everyone in the family takes so they truly become family memories. There is a link to the column and a how-to article I wrote in this week’s link post. And while visiting family, you may be asked to help out with their technology. I’ve written about that in the past and have links for those as well.